Phyllis Meshulam is a poet teacher with California Poets in the Schools, and came on the mission as the recreation therapist, charged with keeping the children entertained while awaiting their surgery. 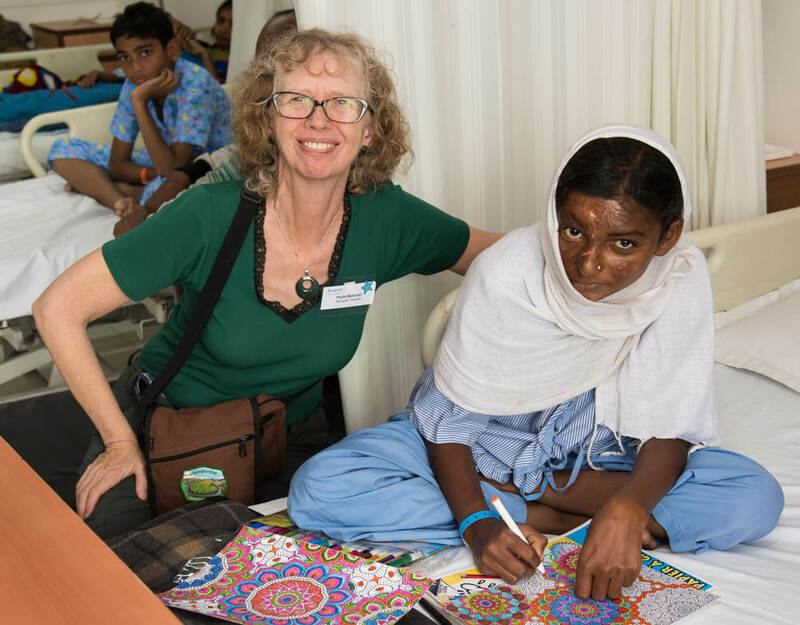 On Wednesday afternoon after most of the younger children had gone down to the operating room, she thought to ask the older kids if any of them would like to write a story. Only Leelawati (pictured above) was interested. She filled the page with Hindi characters lineated like a poem. Phyllis wondered if it was. One of the nurses said that it was Hindu prayer and an orderly sang it for everyone. Phyllis thought it might work to write a group poem. She just happened to have Juan Felipe Herrera’s,”Let Us Gather in a Flourishing Way” on her phone. She read it to the group and, considering that levels of English comprehension varied, the attention paid to the poem was quite impressive, including several staff who gathered to listen. Phyllis gave the children, all of whom by then were really interested, a first line: “Let us gather on the ward.” She then invited the kids to contribute a hope, a companion, a dream that they bring with them to the ward. One of the nurses helped to translate. It worked so well, Phyllis did it again the next day resulting in the poem below. Take a look and see what Rotaplast patients Abhishek, Lokesh and Leelawati had on their minds. courage and confidence for the surgery. watch television and play with toys. my mother’s father who already died. and singing songs to successful surgery.